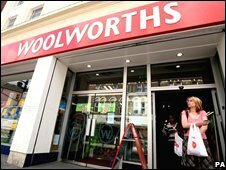 High Street legend Woolworths has buckled under its debt and is set to go into administration, BBC business editor Robert Peston has learned. The move will put tens of thousands of jobs at its 815 stores under threat. The board of Woolies - one of the UK's oldest store groups - is meeting to take the formal decision. Deloitte will be appointed as administrators to the store chain and also to Entertainment UK, which supplies DVDs to supermarket groups. However, Woolworths joint venture with BBC Worldwide, publisher 2 Entertain, will not go into administration as it is owned by Woolworths' parent company. And all stores will remain open and keep trading, at least for now. Money has been ring-fenced so that salaries will be paid to staff as normal on Friday, a spokeswoman added. What is the point of Woolworths? Our business editor says that Woolworths has been something of a lame duck retailer for years, losing market share against intense competition. The company's weak position was also the reason why the government did not intervene to rescue it. "Government policy is not to prop up lame ducks," our business editor said. Peter Mandelson, the business secretary, had been in contact with the company on Wednesday, to ensure that if it went into administration, it would minimise the anxiety to its employees. The company has been asked to do what it can to protect its pension fund, and keep its stores open if possible during the vital Christmas period. The UK's Woolworths has no connection with several retail chains around the world that carry the same name. The news of Woolworths' demise comes on the same day that furniture chain MFI announced that it was to go into administration. The company had asked its landlords for a rent-free period to help sort out its financial problems. However, the troubled company with its more than 1,000 staff, failed to reach an agreement. MFI had suffered several years of financial trouble. Only last September, as part of a management buyout led by chief executive Gary Favell, 81 loss-making outlets were placed into administration. Now the remaining 110 stores could face closure. 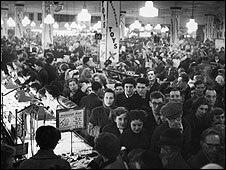 The collapse of Woolworths is also likely to lead to thousands of redundancies with the store chain employing 25,000 people and Entertainment UK employing 5,000. The shopworkers' union Usdaw said the news was "devastating" for staff. "We were hopeful that a last minute deal would be done and will want to meet with the administrators as soon as possible," the union's national officer John Gorle said. 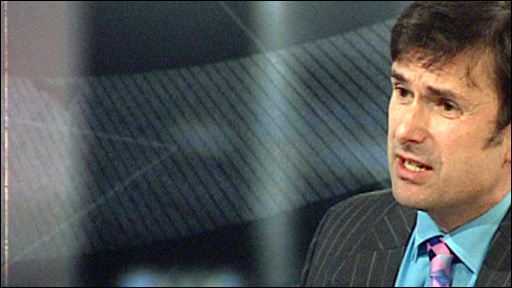 BBC business editor Robert Peston: "Woolworths was weak for years"
The company has struggled under the weight of £385m of debt. Its problems were compounded over the past couple of months when it was forced to pay cash when buying goods from suppliers, because trade credit insurers were no longer prepared to insure suppliers to Woolworths. During the past few days the company had tried to sell itself for a nominal price of £1, where the new owner would have to take on the firm's debt. US restructuring firm Hilco was rumoured to be a potential buyer, with the BBC's commercial arm set to take over Woolworths' share in music and film publisher 2 Entertain. Earlier this week, Woolworths' largest shareholder - property tycoon Ardeshir Naghshineh - had called on Woolworths to delay plans to sell parts of the business. Mr Naghshineh said the firm should instead look at making money by selling of some of its outlets. In the end Woolworths' board ran out of time.